Jesus was going through the city of Jericho. In Jericho there was a man named Zacchaeus. He was a wealthy, very important tax collector. He wanted to see who Jesus was. There were many other people that wanted to see Jesus too. Zacchaeus was too short to see above the people. So he ran to a place where he knew Jesus would come. Then Zacchaeus climbed a sycamore tree so he could see Jesus. When Jesus came to that place, Jesus looked up and saw Zacchaeus in the tree. Jesus said to him, "Zacchaeus, hurry! Come down! I must stay at your house today." When Zacchaeus demonstrated his desire to see Jesus, Jesus looked up and saw him, then told Zacchaeus that he needed to stay with him. 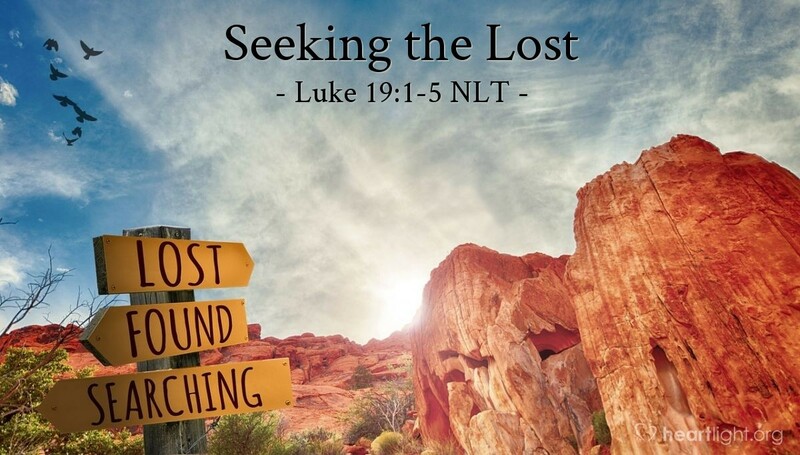 God wants us to know that when people are actively seeking the Lord, he seeks after them until he finds them! Not only does he willingly listen to those whose hearts are burdened (Luke 18:1-14), he also reaches out for those who are seeking him. This is true even if they are outcasts in their own world like Zacchaeus (Luke 5:27-31; 19:7). Father, I know you longed for me to be your child even before I had begun to seek after you. Thank you for finding me and bringing me into your family through the gift of your Son. In Jesus' name I praise and thank you for your grace that has brought my salvation. Amen.